The modern alternative to culture & engagement surveys. It's a task list item for someone in HR with little to no buy-in from senior leadership. A culture of continuous improvement, driven by everyone, focused on iterative improvements everyday. Unseen, unmanaged risks that could lead to a very public "uh oh" moment. Teams with a culture of addressing issues early and often to remove threats that could lead to catastrophe. Either not enough data to make a decision, or too much data without any clarity on how to use it. Insights that engage teams to create actions, innovate and remove blockages to performance. Change is forced from the top down and then diluted along the way. Change is driven from the bottom up, guided by the organisation's strategy. It's a long, risky and expensive process that is filled with blind spots. Change happens everyday, incrementally, with lower risk and self correction. It's our advantage. Teamgage is a culture improvement tool for enterprise. It is the modern alternative to culture and engagement surveys, with a focus on business outcomes and continuous improvement. 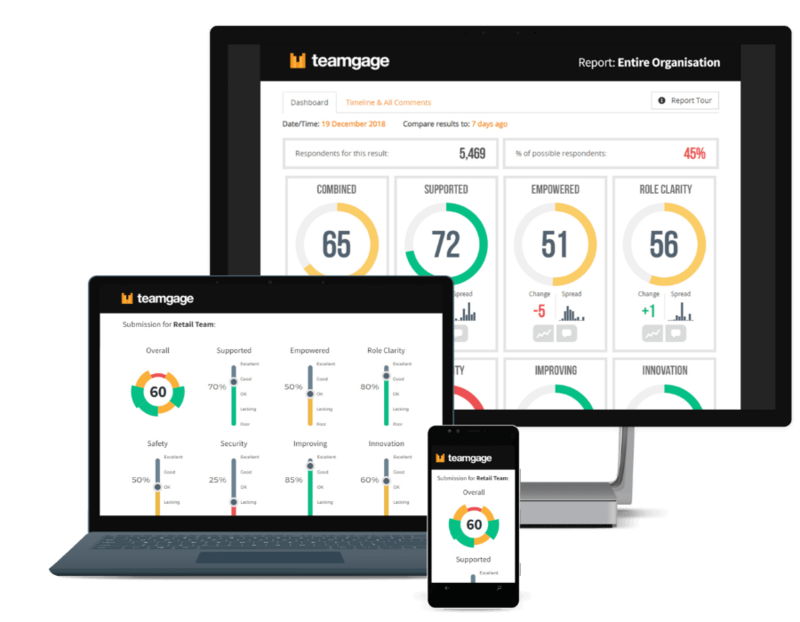 Teamgage helps organisations gather employee feedback in real-time, and guides teams and management within the organisation to drive their own improvements in areas critical to the business strategy. We are trusted by Fortune 500 and ASX 100 companies across the world. Teamgage replaces the old model of change and transformation with a modern approach using the agile framework. This means better and more immediate feedback, lower risk and cost, shorter timeframes and a better outcome. Ever feel like you are drowning in data? You're not alone. On average an organisation will use just 0.5% of the data it collects. Teamgage is different - it focuses on the business outcomes that matter to your organisation, then equips and guides teams and managers to drive improvement in those areas themselves from the bottom up, rather than relying on change being pushed from the top down. The system has a bias towards action and iterative improvement, with an understanding that improvement is everybody's responsibility. Teamgage is focused on business outcomes, not data collection. Change doesn't have to be risky. Teamgage is designed to create a culture of continuous, iterative improvement. Trial new ideas quickly, double down on what works and remove what doesn't. Using an iterative improvement cycle let's you drastically reduce the cost and risk associated with change. Surveys are so last century. Teamgage lets employees provide feedback on any device with our beautiful and unique 20 second submission interface. Your reports will then update in realtime, 24/7. Teamgage is great for desk based employees, but we also provide a first class experience for mobile workforces and employees without corporate devices or accounts like construction workers, nurses and aged care staff, remote sites and more with our unique feedback kiosks, SMS and submission card options. We'll start by finding out what's important to your organisation, and what aligns with your strategy. We don't believe culture should be a separate "HR thing". It should be an integral part of your organisation. Does your workforce deal with dangerous situations like construction? Then a safety culture will be paramount. Do you have people that have to handle stressful situations? Your focus might be on wellbeing and resilience. Looking to be on the cutting edge? That will require a focus on innovation. Real-time reports are generated for leaders of any team, level or demographic, giving a living view of the organisation. This is where the magic happens. Each team reviews their results together, becoming engaged to own and drive the improvement process. With actions assigned in the team meeting to improve the results, each cycle allows the team to monitor what works well and not so well. What is the graduate experience like? How consistent is our performance across regions? we're too busy right now / we are going through a lof of change right now ? Now is the time to use Teamgage - while you are going through change and busy times - not after. The system is designed to help you through periods of change and will actually reduce your workload by helping you navigate around potential disasters that take 10x longer to fix retrospectively. Have you worked with anyone in our specific industry? Based on the range of organisations we have worked with, probably yes. Get in touch and we’ll send you through a case study. You mentioned it's tailored to our organisation, how customisable is it? Teamgage is highly customisable and our staff will spend the time to get a solution that is right for you. We’ve worked with customers on a wide range of topics like customer focus, workloads, quality, employee experience, safety, innovation, trust, communication, compliance, security, even atmosphere and office banter! The key is to align your improvement areas to the strategy of the organisation so that culture and strategy are in lockstep, rather than treated as separate concerns. Absolutely. We understand that large organisations need assurances around security and compliance. We’ve worked with Fortune 500 and ASX 100 companies and understand their unique requirements. We use enterprise-grade infrastructure, processes and procedures, powered by Microsoft Azure. Teamgage is offered using a Software as a Service (SaaS) model. We provide access to the system through our web interface which is compatible with most modern browsers and devices. Submitters can access our submission interface from desktop, tablet or mobile, and our reporting interface looks great on presentation screens in meeting rooms of all sizes. If you'd like to talk more about how Teamgage could work in your organisation, book a demo, view our case studies or ask a question, then please get in touch. © 2016-2019 Teamgage Pty Ltd. All Rights Reserved.